Introduction: Acute scrotal edema is an infrequent but well-known complication in patients on continuous ambulatory peritoneal dialysis (CAPD), occurring in 4-10% of patients. It happens from peritoneal tears, leaks around the catheter or most commonly from an inguinal hernia or patent processus vaginalis. Due to the subclinical nature of these hernias, diagnosis is difficult. A number of diagnostic measures have been tried, including peritoneography, peritoneal scintigraphy, ultrasound and CT scan after intraperitoneal contrast, with varying degrees of success. However, when planning an operative approach, the surgeon must be confident the pathology is a hernia, and differentiate right, left, or bilateral. Therefore, we have chosen diagnostic laparoscopy in conjunction with open unilateral or bilateral mesh hernia repair as the procedure of choice for PD patients with acute scrotal edema. We report four cases of scrotal edema in established CAPD patients. Case reports: Chart review was performed on four patients who were treated for acute scrotal edema while on CAPD. The physical exam was nondiagnostic in all cases, revealing diffuse edema and no palpable hernias. Plain CT and ultrasound were not helpful in localizing the source of the edema in patient one and three. CT with peritoneal contrast revealed a hernia in patient two and a patent processus vaginalis in patient four. All patients underwent diagnostic laparoscopy which revealed a unilateral peritoneal defect consistent with an indirect inguinal hernia. That side was repaired using an open mesh technique. All patients recovered well and re-started CAPD without complications. Discussion: Acute scrotal edema in patients on CAPD is not uncommon, and is very disruptive to the patient. If it occurs early after surgery, it may be from leakage around the catheter or a peritoneal tear. However, the more common etiology at any time after insertion is inguinal hernia or patient processus vaginalis. Most patients will have a combination of diffuse soft tissue edema and hydrocele. Therefore, during this period, physical exam looking for IH will be very difficult and inaccurate. Imaging studies are also less than 100% sensitive in diagnosing unilateral or bilateral inguinal hernias. Since patients will need to discontinue CAPD and use hemodialysis during the period of diagnosis and treatment, rapid and accurate diagnosis must be made. Laparoscopy allows direct visualization of the peritoneal cavity through a 3 or 5 mm scope and can diagnose inguinal hernias with nearly a 100% sensitivity and specificity. It is performed concomitantly with open repair with mesh, adding little or no risk to the patient. 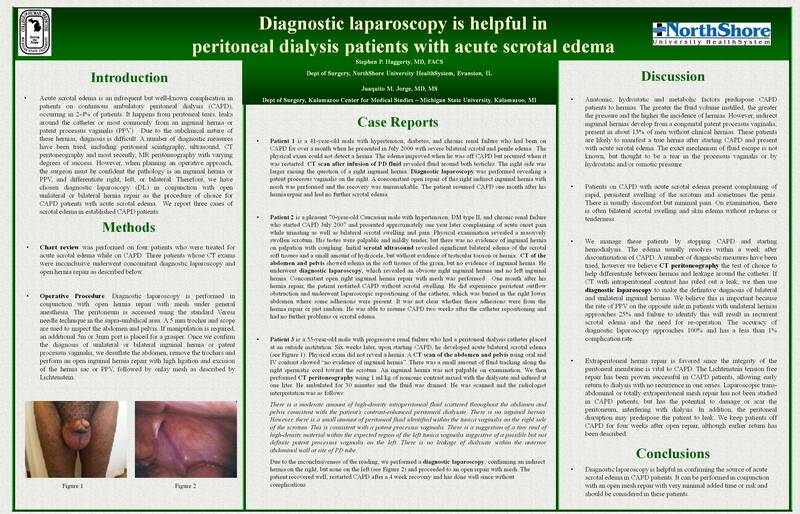 Conclusion: Diagnostic laparoscopy is helpful in confirming the source of acute scrotal edema in CAPD patients. It can be performed in conjunction with an open mesh repair with very minimal added time or risk and should be considered in these patients.